Born in Chilleurs-aux-Bois in 1876, Madeleine Vionnet was apprenticed to a dressmaker while still a child. She began her career in fashion working for makers of lingerie, as well as dress-makers and couturiers in London and Paris. These early experiences of craft skills and, in particular, the relationship between body and fabric involved in making under-garments, influenced the future direction of her own designs. She learned to respect the intricate skills of craftspeople, who were able to produce delicate effects through, for example, drawn threadwork and fagoting, which created spatial patterns by moving and regrouping the fabric's threads. This fascination with minute detail and the possibilities of fabric manipulation formed the foundation of her approach. Her background in the couture trade was fundamental to her later status, since it distinguished her as a craftsperson who was knowledgeable about the various dressmaking skills and decorative trades that supported designers. She was therefore not only tutored in practical skills but was also aware of the status and treatment of young women who worked in the ateliers. 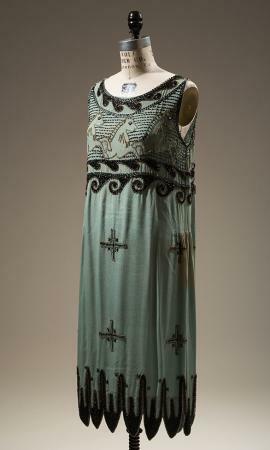 Around 1900 Vionnet moved to Callot Soeurs's celebrated couture house in Paris. There she began to understand the significance of garment design that sprang from draping fabric directly onto a live model, rather than sketching a design on paper and then translating it into fabric. This approach necessarily focused attention on the body and its relationship to the way fabric was draped and sculpted around its contours. Vionnet exploited this technique to the full. For Vionnet, draping-in her case on a miniature, eighty-centimeter mannequin-became crucial to her design philosophy. It enabled her to think of the body as a whole and to mobilize the full potential of the springy, malleable, silk crêpes she came to favor. At Callot Soeurs these methods were combined with an acute awareness of fashion and style, as skillful designers and saleswomen sought to mold couture's elite tastes to each client's particular figure and requirements. Vionnet encountered high fashion and learned its seasonal rhythms, while she experimented with the dressmaking skills she had acquired over the years. An example of this was her adaptation of Japanese kimono sleeves to Western dress, which produced deeper armholes that made the silhouette less restrictive and enabled the fabric to flow and drape around the upper body. This early innovation incorporated several of what were to become Vionnet's trademarks. For example, her use of Asian and classical techniques freed fabric from established Western dressmaking methods that tended to fix the cloth, and therefore the body, into position. Her focus upon draping and wrapping rather than cutting and tailoring to the figure enabled her to achieve maximum fluidity, enhancing movement and flexibility. Her concentration on experimental construction techniques tested the boundaries of design and dressmaking and allowed her to create clothing that derived its significance from subtle reconfigurations of cloth, rather than from dramatic surface decoration. For Vionnet minute attention to detail was paramount. Vionnet's career may have started during the late nineteenth century when fashion was predicated upon exaggeration, novelty, and decoration, but there were already intimations of new types of femininity and clothing that would enable greater physical freedom. 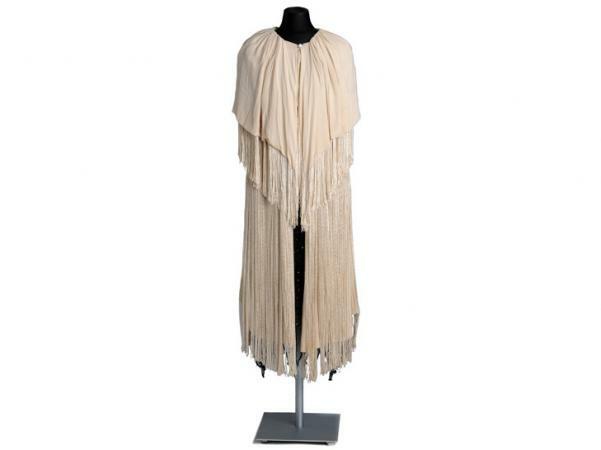 These came partly from utopian dress reform movements, but also from other designers, such as Fortuny, who used historical dress as a source for comfortable yet luxurious dress. When Vionnet moved to the house of Doucet in 1907, she became more daring in her display of the female figure, inspired by avant-garde dancer Isadora Duncan's barefoot movements and by her own desire to strip fashion to its essential elements: fabric and body. She insisted that Doucet's models walk barefoot and corsetless into the couturier's salon for his seasonal fashion show. Her dramatic exposure of the models' skin enhanced the fall of the fabric as they moved and brought sudden focus onto the natural figure. Vionnet helped to instigate modern fashion's exploration of private and public, with her designs' reliance upon a sophisticated interplay between sheer and opaque fabrics draped to swirl about the skin. Many found her work too controversial, and her main clients were stage performers, used to their public roles and more ready to experiment with avant-garde fashions. The déshabillé, a fashionable and fluid garment previously worn in private, became acceptable, if still daring, for entertaining at home. In Vionnet's hands its light drapes created a shimmering cocoon reminiscent of lingerie. For example, the French actress Lantelme was photographed in 1907 in a loose tea gown, the pastel tones and matte glow of its layered chiffon illuminated by beading and sequins. In 1912 Vionnet opened her own house in the rue de Rivoli. It was closed, however, at the outbreak of war in 1914, and Vionnet moved to Rome for the duration. Her experience there, as well as her studies of ancient Greek art in museum collections, became another crucial aspect of her work. Classicism, both as an aesthetic and design philosophy, provided Vionnet with a language to articulate her belief in geometrical form, mathematical rhythm, and the strength of proportion and balance as a basis for the garments she created. During the late teens Vionnet focused on the process of wrapping lengths of fabric onto the body in the style of the Greek chiton. Through these experiments she exploited the advances made in fabric technology during World War I that had produced yarns that could be made into more supple fabrics, and she had extra wide lengths of material created for her to allow even greater drape. Vionnet was thus able to push her examination of construction methods that not only draped but twisted fabric still further than before; moreover, she formulated the potential of the bias cut for which she is so often remembered. To do this she cut the fabric diagonally, across the grain, to produce a springy, elastic drape. Although cutting on the bias had been used for accessories and had been applied to fixed, molded dress forms, it had not been used this extensively for the body of a garment. Vionnet took an experimental leap forward in her desire to release both fabric and figure from the tight-fitting ethos of traditional Western dressmaking. Vionnet reduced the use of darts, often eliminating them completely and therefore allowing bias-cut fabric to hover freely around the body. She also introduced lingerie techniques-such as roll-tucked hems or fagoting to disguise the line of a seam-to both day and evening wear. Her designs aimed for simplicity of overall form and impact, while they frequently employed complex construction techniques. One of the most dramatically minimal of her designs was a dress from 1919-1920, now in the collection of the Costume Institute at the Metropolitan Museum in New York. It demonstrates Vionnet's search during this period of her career for new ways to push the boundaries of the fabric while maintaining tight control over the ultimate hang of the garment. In this example she used four rectangles of ivory silk crêpe, two at the back and two at the front, held together at one point to form the shoulders of the dress. The rectangles hang down the body from these two points, to form two diamond forms of mobile fabric at front and back. Vionnet, in the act of turning the geometric shapes onto the diagonal for the final dress, swung the weave onto the bias. Thus the dress is stripped of dressmaking's usual devices to nip and sew the material for a "fit" with the body beneath; Vionnet instead used the movement released in the fabric to flow and drape around the wearer as she walked and danced. The deep drape of the fabric created vertical bands of light flowing down the figure. These elongated the silhouette, which was first blurred and then brought into relief as the wearer's movements caused the swathes of fabric to shift and form anew. In Vionnet's hands the bias cut was a means to re-think the relationship between fabric and flesh. She constantly tested the methods she had learned during her early career, and her attention to anatomy led to her use of bias cutting not just to allow material to cocoon the figure, but to produce sophisticated forms of decoration. She varied the direction of the material's grain to encourage light to bounce off contrasting matte and shiny pattern pieces. The complexity of her construction techniques meant that her designs came alive only when worn or draped on the stand. They were conceived for the three dimensions of the body and cut to smooth over the figure: evening dresses dipped into the small of the back; day dresses slid under the clavicle to form a soft cowl neckline; and bias-cut fabric draped artfully to allow for the curve of the stomach or the arch of hip bones. Such effects were only enhanced as the wearer moved, and Vionnet's interest in contemporary art, and in particular futurism, served to develop this exploration of movement as a further expression of modernism. The illustrations that artist Thayaht produced for the Gazette du bon ton in the 1920s expound futurism's view that art should represent the dynamics of the body in movement. His drawings show women in Vionnet outfits, with lines tracing the curves of the dress into the surrounding environment to suggest the flow of the body, and the fabric, as they walked. He wanted to express the sensation of the space between body and material, and between the material and the space the wearer inhabits, as alive with friction and loaded with the potential to blur air and matter. Vionnet's approach explored women's modern lives and sought to express an adult, liberated femininity. Like modern artists she was interested in the integrity of the materials she used. She also exploited technology by experimenting with new ways to dye fabric, and she was driven to create clothes that broke away from highly decorative, constraining forms of fashion that relied upon historical notions of femininity. However, while she described her clothing as appropriate for any body size or shape, its revelatory exposure of the natural form, and the prevailing ideal of youth and athleticism, meant her designs can be seen as part of the twentieth century's shift toward bodies controlled from within, through diet and exercise, rather than through restrictive undergarments. In 1923 Vionnet moved her couture house to 50 avenue Montaigne, where its salons were decorated in a classically inspired, modernist manner that formed a suitable backdrop to her work. The salon used for her seasonal shows contained frescoes that showed contemporary women clad in some of her most popular designs, intermingled with images of ancient Greek goddesses. Thus clients could measure themselves against classical ideals and see Vionnet's designs through the prism of a revered, idealized past. This placed her designs, which could seem so daring in their simplicity, within the context of classical antiquity's noble precedent and articulated the link between her own focus upon mathematical harmony and that of the past. The various ateliers that produced her collections showed the diversity of her output and her ability to imbue a whole range of different types of clothing, from sportswear to furs, lingerie, and tailored clothes, with her ethos of creative pattern-cutting and subtle, supple silhouettes. Her daywear also relied upon the material's inherent properties and the possibilities to be explored in her integration of construction techniques and decoration. Discreet day dresses were pintucked in neat rows, whose spacing gently pulled fabric in toward the figure at the waist and curved diagonally across the body from shoulders, across the bust, around the hips, and round toward the small of the back to shape the dress. Thus Vionnet's garments were given shape while maintaining smooth, uncluttered silhouettes, and the tucks of materials created a pattern on the fabric's surface. "My efforts have been directed towards freeing material from the restrictions imposed on it, in just the same way that I have sought to liberate the female form. I see both as injured victims…and I've proved that there is nothing more graceful than the sight of material hanging freely from the body." Madeleine Vionnet, quoted in Milbank 1985. During the 1920s, when heavy beadwork and embroidery proliferated, Vionnet was committed to search for methods of ornamentation that took part in shaping the whole garment. Narrow pintucks were used to form her signature rose motif, its size subtly graduated to pull dresses toward the wearer's figure. For Vionnet such exact craftsmanship enabled her to challenge traditional methods continually. Even when she used beadwork, most famously on the 1924 Little Horses dress, she demanded an innovative approach. She commissioned couture embroiderer Albert Lesage to explore new ways to apply bugle beads to bias-cut silk, so that the flow of the fabric would not be interrupted and the images of glittering horses inspired by the stylized, representational forms on Grecian red figure vases would not be distorted by the beads' weight. Even thick furs and tweeds could be given greater fluidity and form through her manipulation of their drape and use of pattern pieces cut to sculpt and form around the figure. Vionnet's couture house grew during the 1920s, and she opened a branch in Biarritz to provide everything from spectator sportswear and travel garments-a growing market as women led increasingly active lives-to her supple evening wear for dinners and dances. By 1932 her Paris establishment had grown, despite the impact of the Great Depression, to twenty-one ateliers. Her attitude toward her employees was as enlightened as her design approach. She remembered her own path through the studios' hierarchy and ensured that workers, while paid the same as in other couture houses, were provided with dental and medical care, had paid breaks and holidays, and were given help with maternity leave and proper teaching in her favored design techniques, such as bias cutting. Vionnet set up her company, Vionnet et cie, in 1922, and with the support of her backers, she pursued a series of business schemes. These included several attempts during the mid-twenties to capitalize on America's reliance upon Parisian fashion for new trends and Vionnet's popularity there, through a number of deals with companies to produce ready-to-wear. Although innovative, these ventures were brief and did nothing to stem the tide of copyists, both in the United States and in France, who cost the couture industry large sums of money each season by plagiarizing original models and mass producing them at lower prices. This practice damaged Vionnet's profits and also reduced the cachet of particular outfits, since couture clients were paying, at least in part, for exclusivity. Despite Vionnet's involvement with a series of couture organizations pledged to track down copyists, and a landmark case in 1930, when Vionnet and Chanel successfully sued a French copyist, this plagiarism was a recurrent problem that haunted the couture industry. The last collection Vionnet produced was shown in August 1939 and acknowledged the current vogue for romantic, figure-enhancing styles. Fragile-looking black laces were traced over palest silver lamé, with appliquéd velvet bows to pull out and shape the lighter weight lace overdress and add fashionable fullness to skirts. Vionnet closed her house on the outbreak of World War II. Her work had been hugely influential in both Europe and the Americas during the period between the wars. While she sought to stand outside fashion and create timeless clothing, her liquid bias cut became a defining emblem of 1930s sophistication and style and inspired Hollywood designers to use bias-cut gowns to create iconic images of actresses such as Jean Harlow. Her experiments with fabric control and manipulation and the advances she made in testing the boundaries of fabric construction left a complex legacy which has inspired designers as diverse as Claire McCardell, Ossie Clark, Azzedine Alaïa, Issey Miyake, Yohji Yamamoto, and John Galliano. When Vionnet died in 1975, her place within the history of fashion in the early twentieth century was assured. Perhaps because of the lack of drama in her private life and her unwillingness to give many interviews, she was less well known than some of her contemporaries. However, Vionnet's focus on experimentation and her desire continually to redefine the relationship between body and fabric provided women with clothing that expressed the period's dynamic modernity. Vionnet embraced the dressmaking skills she had learned as a child apprentice and elevated them to new levels of complexity, yet she always strove to produce finished garments that preserved, and indeed celebrated, the integrity of the materials she used and the natural shape of the wearer's body. She viewed couture as a testing ground for the new identities that the twentieth century created. Her clients became living embodiments of modern femininity, clad in garments inspired by contemporary art, Asian wrapping techniques, and classical antiquity. In Vionnet's hands these elements were united into dramatically simple silhouettes. Vionnet's intimate knowledge of cutting and draping enabled her to create clothing that expressed the dynamism and potential of women's increasingly liberated lives. See also Cutting; Embroidery; Film and Fashion; Lingerie; Tea Gown. Chatwin, Bruce. What Am I Doing Here. London: Picador, 1990. Demornex, Jacqueline. Vionnet. London: Thames and Hudson, Inc., 1991. Kirke, Betty. Madeleine Vionnet. San Francisco: Chronicle Books, 1998. Koda, Harold, Richard Martin, and Laura Sinderbrand. Three Women: Madeleine Vionnet, Claire McCardell, and Rei Kawakubo. New York: Fashion Institute of Technology, 1987. Exhibition catalog. Milbank Rennolds, Caroline. Couture: The Great Designers. New York: Stewart, Tabori, and Chang, Inc., 1985.